Gardens of the High Line lets you see and learn from Manhattan’s High Line Park. This park has caused quite a stir in New York and across the nation because it reclaimed an industrial relic and created a popular public space in a crowded city—and also because its plantings are beautiful and innovative. You’ll learn the history of the park, how it was designed, how plants were chosen, and how they are maintained. The spectacular photos, taken in all seasons, let you feast your eyes on this bit of horticultural heaven in the midst of a crowded city. You can use the book to prepare for a visit, seek inspiration for local gardens or public design, or to learn from the park’s wildish gardening style. 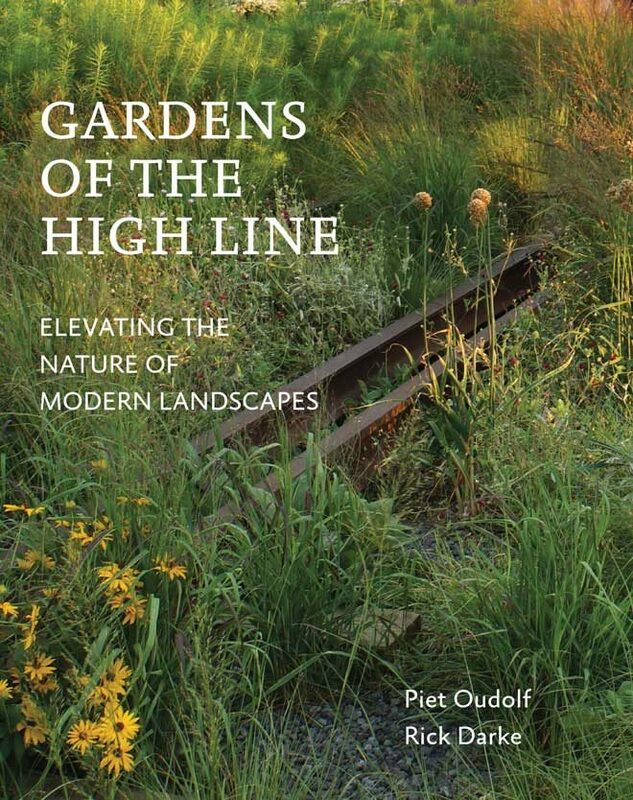 The photographers and authors of the book are the landscape designers Piet Oudolf, who created the park’s planting design, and Rick Darke, a photographer and former curator of plants at Longwood Gardens. The introduction is by Robert Hammond, who co-founded, with Joshua David, the nonprofit Friends of the High Line to shepherd the creation of a park from an abandoned elevated railway. The structure was built 30 feet above the streets in 1934 to protect pedestrians from trains. Between its last use as a railroad in 1980, and the founding of the Friends to save it in 1999, weeds, mixed with some natives, had taken over. The Friends hired James Corner Field Operations, Diller Scofidio + Renfro, and Piet Oudolf to reclaim it for a park. The High Line is basically a roof garden, with an average soil depth of 18 inches. It is typically 30 feet wide. And yet the gardens are so immersive that when walking its 1.45 miles one often forgets to look up at the tall buildings or down at the busy streets below. Forty percent of the plant species used are native to the eastern or midwestern United States. The others are drought tolerant as defined by regional standards. The plantings support native insect and bird wildlife, and give the impression of being wild landscapes, in part through plant choice, and in part because they are arranged informally and groomed lightly by editing rather than by strict control. Plants are allowed to spread a bit, self-sow, even crowd each other out; new species may be introduced to see how they will work in the mix. If you are interested in learning more about the High Line, including a schedule of general and themed tours, visit www.thehighline.org. To learn about other innovative public park spaces from around the country, check out www.network.thehighline.org. On the West Coast, featured projects are the Seattle Waterfront, San Francisco’s Crissy Field and Presidio Tunnel Tops, and the Los Angeles River project.